Ally Mollo, the creator of a doll empire. 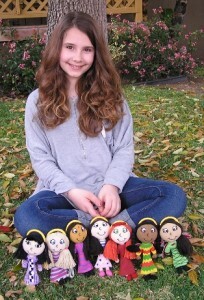 Ally was not satisfied with just being an entrepreneur, she wanted to be a “socialprenuer.” She decided that a portion of the doll sales should go to one of three charities that help children, which she carefully chose herself: Elizabeth Glaser Pediatric Aids Foundation, Child Find of America, and Children Incorporated. Each doll carries a registration code, which allows the customer buying the dolls to choose the charity to which the portion of the sale shall be given. Ally considers her business to be “a great learning experience and it’s been wonderful hearing from other little girls around the U.S. that write me about how great the angels are and how they have helped them.” She nevertheless admits that there were challenges along the way. She reveals: “My biggest obstacle was that I didn’t know all of the things that it took to start a business. I had to learn the process and a lot of words that I didn’t even know, like ‘intellectual property’!” She was also surprised to discover that it takes time “to get things going and patience.” In terms of costs, Ally was fortunate to have the support of her parents, who helped her pay the prototypes for each doll and the materials needed to make them. The dolls have so far been greatly successful. In 2011, they were selected by Time as one of the top 15 Smartest Toys for Young Geniuses. Right now, Ally is working on making an animated show for the dolls. If you want to find out more about Ally and her dolls, visit her website: www.custardnjelly.com, Facebook page: Facebook.com/custardnjelly, Twitter: @custardnjelly.